Spring is here in Manassas, Virginia. Now is the time to tackle those curb appeal projects you have been dying to undertake since fall. But what do you attempt and what needs to be handled by a professional? Landscaping? You can probably handle most landscaping duties yourself: planting flowers, mulching, weeding, etc. Painting your front porch? Head to the nearest Home Depot, buy some paint, and get to work. But what about a new fence installation? For this, you will have to call in the professionals at Hercules Fence. If you are interested in having a new fence installed in Manassas, you have come to the right place. Hercules Fence offers the buying power of the largest fence company based in the state, meaning we can buy the fence you want at a price you will love. We pride ourselves in installing high quality fences at affordable prices. Now you just have to decide on the right fence for you, your home, and your budget. Please take a moment to browse our many residential fence offerings, from custom wood to ornamental steel to chain link, aluminum, and so much more! This week, we are going to focus our attention on one type of fence: aluminum. 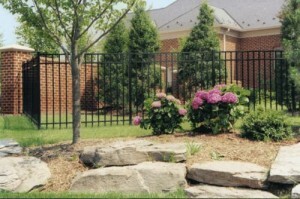 Aluminum fences provide a curb appeal unmatched by other types of fencing. Aluminum fences are much more affordable than you would think. Aluminum fences do not need to be painted annually, making them a low maintenance option. Aluminum fencing with spear-topped pickets are incredibly difficult to breach. If you have any questions about Aluminum Fence Installation in Manassas, please contact Hercules Fence of Northern Virginia today by calling (703) 551-2609 or visiting our website. Also, check out Hercules Fence of Manassas on Facebook, Twitter, Google+ and YouTube! This entry was posted on Thursday, April 24th, 2014 at 4:05 pm. Both comments and pings are currently closed.